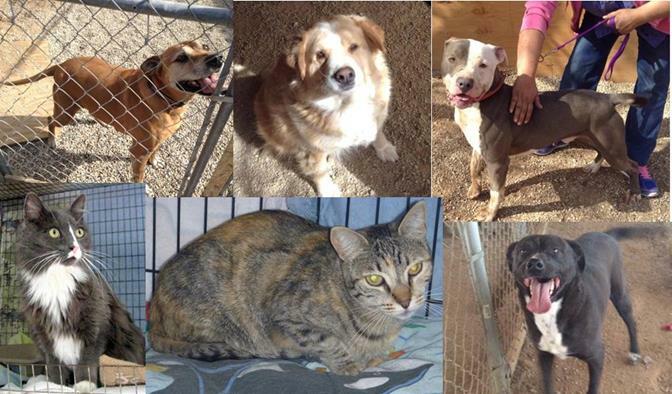 These are just a few of the pets that are in desperate need of a loving home, now that the Garland Ranch has had its license revoked. To view more of the pets in need, click here. PALMDALE – The operating license of Garland Rescue Ranch in Palmdale has been revoked. This means about 30 dogs and 40 cats must vacate the property within 72 hours. Lost and Found Dogs of the Antelope Valley (LAFDAV) has stepped in to help by organizing a special adoption this weekend to save the animals. The special adoption event will be held from 1 to 4 p.m. on both Saturday and Sunday at the Garland Ranch, located at 40939 16th Street West in Palmdale. Interested parties should come ready to meet the pets. If ready to adopt, you will be required to fill out a quick application, and the LAFDAV team will follow up with a home visit to make sure everything is going well. 6-year-old Douglas is one of dozens of animals that must vacate the property in 72 hours. Douglas is good with people and gets along well with other dogs. LAFDAV is waiving the adoption fees, but donations are being accepted to ensure that the animals left behind can be boarded. Both small and large breed dogs of all ages are available, and about 98% of them are in good health, according to Portocarrero. She said they’re most concerned about the Pit bulls, because those dogs are more likely to be put down first. LAFDAV was founded in 2011 as a central online station for locally lost pets. LAFDAV’s mission continues to expand, and the network now provides support, education and funding for the local pet community, as well as a resolution towards pet negligence and abandonment. To see many of the pets that will be available at the special adoption event this weekend, visit LAFDAV’s Facebook page here. For more information on LAFDAV, visit http://lafdav.com. 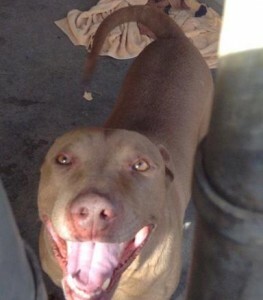 UPDATED 2/3/14: More than half of the pets were vacated from the Garland Ranch this weekend, thanks to the efforts of LAFDAV and other volunteers. The deadline for animals to vacate the property has reportedly been extended for another week, thanks to this weekend’s efforts. There are around 20 pets left, and volunteers are still working hard to provide the remaining pets with a proper home, according to Portocarrero. To participate in this effort, visit LAFDAV’s Facebook page here. 41 comments for "Local shelter’s license revoked, 70 animals need homes"
I wonder if you all are just as passionate about adopting HUMAN children, as you are about adopting these animals ….you know… those two legged creatures that are being raped,molested, and mistreated in shelters and foster homes across the nation. Has anyone here adopted a child?! Yes, I have adopted a child who is now a successful tax paying adult with a family of her own. I am curious about the kind of person who would compare adopting a dog or cat to adopting a child or children. and please enlighten us on what you have adopted…. so??? Get a clue! There are those of us that mobilize and take action during times of crisis, and there are those of us that sit back and do nothing but criticize. Thank God the good folks of LAFDAV fall into the category of action, otherwise the innocent animals would not have been helped. We get it, Garland Rescue made mistakes and needed to be shut down, but WHAT NOW? The story addresses what needs to be done now, but before some people could help they needed to know why Garland lost their permit. Really? Others tried to smear LAFDAV rather than help and asked people to give support to Linda Blair instead. It was my understand that Linda Blair did absolutely NOTHING to get these animals adopted this weekend. SMH! If you didn’t know about LAFDAV before, now you know. They are concerned animal lovers who don’t just talk the talk, or sit around and criticize, they jump in, take action and get sh## done. Kudos to LAFDAV for a job well done!!! I am not saying LAFDAV isn’t a good group, because it is. What I am saying is that the animal community as a whole came together, not just them. What about Halfway to Home, CPA, APET, all of the others that jumped in and were able to make space or find foster care for the animals? So THANK YOU EVERYONE that got involved, and even the people who sat behind their computers that shared the articles, that networked, that made phone calls, that did whatever needed to be done… THANK YOU! A ‘membership’ in LAFDAV is a simple request to join a FB group. Those who have joined…the general membership…are for the most part great people. My issue is and continues to be the illegal and unethical actions of the Founder, admins and leadership(core members). Co-signing each others activities that are well outside of the legal realm. Playing God with the lives of animals. It is just wrong. That was the point I was trying to make in an earlier comment. THE ANIMALS NEED TO COME FIRST, not what was done wrong at Garland. That will come out later and hopefully not be repeated. I helped and adopted, did any of you critics do anything but criticize? They lost their kennel license in 2011. They had plenty of time to come into compliance. Over 20 cats in the freezer, among other things that is not public knowledge. Please know what you are talking about before opening your mouths. This needed to be done, and it should be prevented from happening again. Tons of FB groups, local rescues and individuals from all over came out to support and help them, not just one or two. It was truly amazing how everyone came together for the animals. 20 cats in the freezer? where did you get this info? I googled and can’t find anything about that. Also I wish this story had more info about Garland Rescue Ranch and why they lost their permit, the way this story is written its like an advertisement for the LAFDAV which I have never heard of. As I said some things are not public knowledge…. There were cats and small dogs in the freezers in the white house and the Garland house. I saw it with my own eyes as I volunteered there almost 3 years. Volunteers paid for a lot of the medical and supplies for the cats not Garland. No hot water to wash anything. Roof rats running all over the place. Insufficient bathroom facilities. I have a cat from there and he had a swollen ear lobe that was filled up with blood, which was caused by ear mites. It needed to be lanced, but was not. The owner tried to do her own vet care. The ear is now deformed and crinkled. It has effected his eye also. He is 14 years old. Other cats had died due to no medical attention. I am glad the place is now closed, and do think this person should never be allowed to do this again. It’s really a shame that this had to happen to the rescue. The people running the rescue and Mr.Garland all have good intentions. Having spent many hours volunteering there when I was younger, I saw first hand how they care for animals, they will not turn an animal away regardless of age, breed, or any other factor, they only want to save them from the streets and stop them from going to the shelter. Mr. Garland is an elderly man who supports the rescue through his retirement, which is difficult for anyone to live off of, let alone run a rescue, pay for shelter, utilities, food, vet bills, his own personal self, and the demanding difficult, County that is only out for itself. Which is why they relied on donations, and volunteers. It’ a shame they did not have the money to pay their dues to our great Los Angeles County, but Mr. Garland, the shelters volunteers, and the rescue as a whole always had an open heart and the best of intentions for the community and the animals. I am hoping this page is full or animal lovers who are reading it, China is skinning ALIVE up to 100,000 k cats and dogs a day, say no to fur, even faux fur can be mislabeled, it has to stop! Yup, and someone needs to let Joe Namath and tha NFL that sporting a coat made of coyote fur is not cool.What a jerk, it looked much better on the Coyotes. It doesn’t matter when or why their license got revoked. The bottom line is that there are animals that need our help. Period, the end. And yes, I’m helping by adopting, are you? It absolutely matters why. Adopting is great…but it is not solving the issue that lead up to this problem. Negating the real issue of negligent and unlawful rescues is irresponsible. Id does matter why, if the animals were being abused it matters, if the reason was unjust it matters so citizens back the Shelter in restoring the license, sorry I missed the article in time to adopt :(, my adult cats would hate me though. HHHMMM? SO WHY DID THEIR LICENSE GET REVOKED? THATS WHAT THE ARTICLE SHOULD BE ABOUT, IM JUST SAYING!! They lost their kennel license in 2011. It was due to regulations they could not meet for the number of animals they had. One being a requirement to have a water tower. They have been repeatedly told to reduce the number of animals they have since 2011. This so called “raid” was DA investigators and animal control. A criminal investigation is ongoing. Poor conditions, dead animals in freezers…..
And there is much more to this story that can’t be told. And FYI….more research prior to publishing a hyped up lie would have shown that Garland lost their kennel license in 2011. They have been under orders for YEARS to reduce their numbers. There is an ongoing investigation that may lead to criminal charges. Animals in freezers…..quite a few. I say it is seriously time for a drastic change in the oversight of rescues (foster or kennel based). LAFDAV is NOT a licensed rescue and cannot legally accept donations. They steal dogs and sell them. I am using my real name. I accept my statement as my own and can prove every word. From reading this article, I don’t see “donations” as the primary focus. I see a well-meaning group of people that are trying to get these pets adopted and into good homes before a looming deadline. Why kill the momentum with negativity?? I’m sure the cause could use help from both Linda Blair’s group and LAFDAV. After all, we’re talking about 70 animals. Addressing the issue that created this problem. Which NOBODY is doing. There is fraud and rouge groups. Laws need to be followed. Garland is at fault and should be held accountable. LAFDAV is just a FB group. They are NOT a rescue and NOT the only group helping at this adoption event. Yet..it is all about them…well..Jeanette. “Rogue” is the word you’re looking for. Rouge is blusher make-up for the cheeks. Dang….didn’t even notice that. Autocorrect got me…bet it is wrong all over the place. The article never once referred to LAFDAV as a rescue. It simply said that they had stepped in to help. And frankly any private organization can except donations given to them. They have never attempted to mislead people into thinking that their donations would be able to be written off for tax purposes. If someone wishes to contribute money to an organization that they believe in that is their choice. This is where education would be great. It is considered INCOME and is taxable. Sure hope the Founder is filing appropriate income tax for all these “donations”. Again…there are LAWS and REGULATIONS …but people want to do WTH they want. Nobody is above the law. In the end, when laws are not followed, animals suffer. Why would LAFDAV be taking donations when Linda Blair has stepped up and offered to help? One is an actual rescue with a non-profit status..one is a dog stealing/flipping group on Facebook. Donate to Linda’s group that actually has the means and connections to get the job done. Not a group that threatens to sue you if the dog you find and return to the owner gets a reward …and you don’t give it to the admin of the group LAFDAV. Even though all they did was have one of at least ten FB groups for lost and found dogs in the AV. If rescues are overloaded…and need boarding…we charge 1/2 price… $15 per night for rescue dogs. Feel free to call us 661 251-1481. We are on Sierra Hwy in Canyon Country. I put the word out for adoption to everyone I know! Awesome news….I will let others know. Canyon Kennels is always amazing! I have never heard of LAFDAV. But just taking the time to read ‘the rules’ on their website, you can clearly see what a scam they are running. People who find the dogs do all the work and financial needs of the animal, yet LAFDAV requires that person to give them all them money. I could see if LAFDAV where the ones paying for the vet bills and what not……but they are not. Why don’t you go read the rules again. It says that a reward given for reuniting a pet with its owner as a result of work done by the lafdav group is due to them. It also states that the person who fostered or helped the dog will be compensated for their expenses. Frankly most of the time it is a group effort which is required to get a dog or cat back to its rightful owner. The reward money goes to helping future dogs and cats. If you find a dog and go place flyers by yourself and the owner sees the flyer and calls you lafdav does not expect you to hand over that reward money. It is only when the reunited of a dog or cat was the result of the networking effort of lafdav. No…that is not accurate. If you find a dog and then post it in her group…or see it posted in her group…and you reunite the dog with the owner and get a reward…she demands the money. She has since removed the threat of litigation, but there are screen shots of the entire discussion in her group. It is sad when such a demand is put on people. People don’t have to believe a single thing posted here. Feel free to join the group and read along with what goes on in there. Linda Blair only took pictures and offered to transport these dogs. Thats it. . Thank you. hrm.. someone should dig into the why’s and how’s it got revoked; smells like shenanigans to me – is there an temporary stay order that someone can file? It is tragic that so little time is given to this rescue. All the animals in their care are in good shape – what was the rationale behind taking their kennel license? Was this the only option? A rescue group like this, that takes hard to place and otherwise throwaway animals, is essential. The community is the loser in this situation. I am sorry that the county chose to do this. Best of luck to the folks who have taken care of these friends and who are doing so much to ensure they will have safety and forever homes. I agree with you 100%. The people at Garland are not hoarders and do what they can to keep homeless animals safe and find them homes. I feel really bad for them. If I lived closer, I would be there to help them. They do a service to the community and deserve some support and a break from AC. Generally, Animal control gives many warnings before they take such a drastic step. It might not even have anything to do with the care of the animals, but the accounting or permit issues. Perhaps there were many noise complaints from the neighbors that went unaddressed. Since they were given time to move the animals, and not confiscate them, it is probably not a care issue. There is much more to this story then what is being reported. I completely agree. The Department of Animal Care and Control has put this rescue on notice but fell on deaf ears. This hardly came as a surprise. This is a prime example of a rescue not knowing there limits.